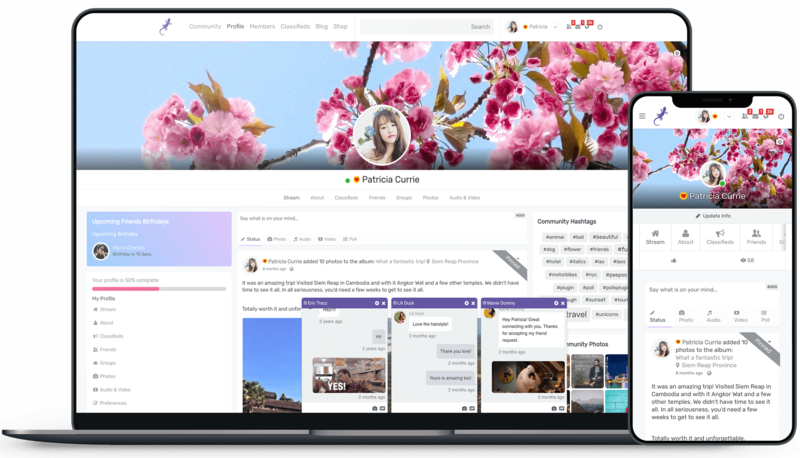 Gecko Theme was designed with PeepSo First approach in order to enable us make the most of PeepSo as a Social Networking Platform. It definitely extends the possibilities of our plugins and comes with support of other 3rd party solutions like: WooCommerce, LearnDash or Easy Digital Downloads just to name a few. It can be used as a standalone WordPress theme and does not require PeepSo to work properly. Gecko created by the same team that brought you PeepSo and its plugins. Designed to take PeepSo and its plugins to another level with additional features 3rd party themes just can't provide. Works great on phones, tablets and other mobile devices. Supports all modern desktop browsers. You have a choice of layout options for profiles: Default, Boxed or Full cover. Easy customization options built-in the theme. There are also options to modify the logo add custom css, custom code for your Google Analytics or other tracking systems. Personalize your site with just a couple of clicks. Amongst many, Gecko Theme comes with options to customize your site's footer. Up to 5 columns for widgets, footer menu position, color options and more. Gecko comes with a gorgeous header that can contain navigation, activity search, PeepSo live notifications and more. Add menus, including menu alignment, and menu position. All out of the box and available in Theme Customizer. You can place widgets in the Search and Header positions to place additional navigation, shopping cart or more. Create amazing landing pages for your site. Add Title, Call To Action text, Featured Image. All within your Page settings. Create as many landing pages as you'd like. Comes with 4 styles for your widgets: none, Box, Bordered and Gradient. The styles can be applied to any widgets. Apart from obvious color customization in text, links etc. Gecko comes with the option to customize the Gradient colors of the widget backgrounds. Header, Top, Bottom, Footer, Sidebars widget positions let you surround content from every side many times over. You can easily customize the number of columns in each position as well. Gecko Theme is completely standalone and does not need PeepSo to function properly. 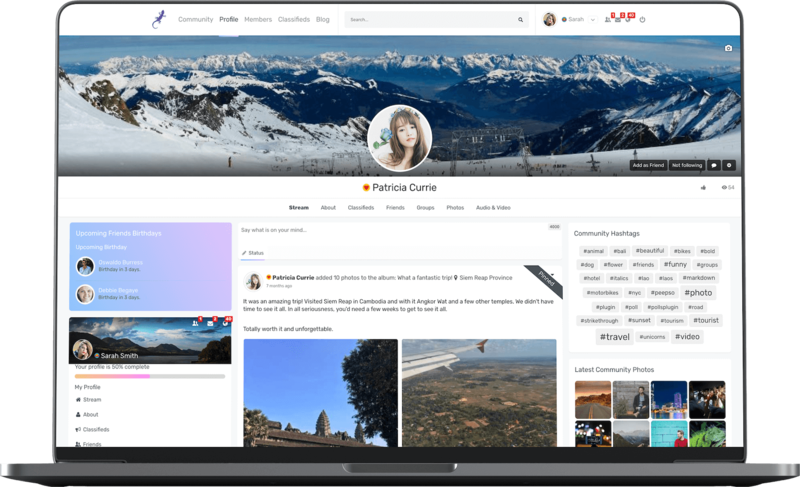 With PeepSo, you can have a seamless experience between community, blog and other parts of your WordPress site. Gecko comes with a beautiful WooCommerce integration that's fully customizable too. LearnDash support is also built into our theme. You can create gorgeous online courses with Gecko and LearnDash. Selling digital goods? Great! Gecko also supports Easy Digital Downloads. Super fast loading times unobstructed by redundant scripts. Easy to adapt to your liking whether configuration or overrides. Beaver Builder and Elementor are recommended ones at this point. Full Gutenberg Support plus an addition of own Gecko: Container block that allows grouping other blocks. Support for no additional cost. Support is provided to active license holders. Number of supported sites is dependant on the license choice. Single annual license subscription means you don't have to worry about renewals when the time comes. It's automatic. You can cancel at any time. As long as you have an active license you have full access to theme file downloads. With active license you have access to updates and upgrades.